The New York Giants, in their second year of existence in the NFL, had a 4-3-1 record as they hosted the Duluth Eskimos on November 11, 1926. Coached by Joe Alexander, a physician as well as player-coach, the Giants were struggling in competition with the New York Yankees of the new American Football League (the first to be known by that name) that included star HB Red Grange on the roster. While they had lost several players, as well as their first head coach, to the new circuit, New York had a good team that included FB Jack McBride, TB Hinkey Haines (pictured above), and promising tackle Steve Owen. While they had yet to give up more than seven points in a game, they had been shut out three straight times in the early going. Duluth had been in the league two years longer than the Giants, having started out as an independent club before joining the NFL. 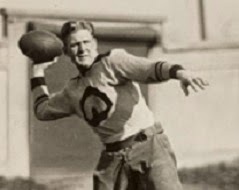 The Eskimos were coached by owner Dewey Scanlon and played almost exclusively on the road, banking on the notoriety of rookie FB Ernie Nevers (pictured below), an All-American out of Stanford with tremendous all-around ability and ferocious intensity on the field. Despite utilizing a small roster of only 13 players, “the Iron Men of the North” arrived in New York with a solid 4-1-2 record and promised to provide a major test for the Giants. There were 5000 fans for a Thursday game at the Polo Grounds in 20 degree weather. The Giants received the opening kickoff and drove effectively, with Jack McBride handling most of the ball carrying. McBride finished off the series with a dive into the end zone and also added the extra point. Duluth responded with an equally impressive drive. The big play was a pass from Ernie Nevers to back Cobb Rooney that gained 40 yards. Nevers capped the series with a two-yard touchdown run and kicked the point after to tie the score at 7-7. After the two scoring drives, the teams settled into a defensive struggle for the remainder of the first half. In the third quarter, the Giants went back on top as Hinkey Haines ran for a 25-yard TD. McBride again successfully converted to make it a 14-7 game. That was the case as the contest moved into the fourth quarter. With time running out and the ball at their 20, the Eskimos advanced down the field. Nevers carried most of the load and accounted for six first downs along the way. He scored his second touchdown, but his try for the extra point was blocked by tackle Tilly Voss. The Giants held on to win by a final score of 14-13. The Giants lost their next game but won their remaining three league contests to finish with an 8-4-1 record that placed seventh in the 22-team NFL (divisions did not yet exist). Duluth, playing its brutal road schedule, lost games on the following Saturday and Sunday and ended up eighth at 6-5-3. The Eskimos continued on traveling into February as they also played numerous exhibition games. 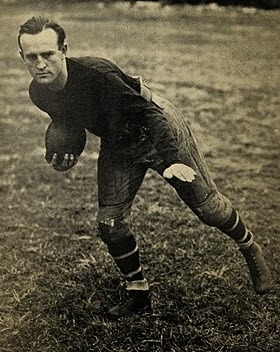 Jack McBride topped the Giants in scoring with 48 points on his five rushing touchdowns, 15 extra points, and one field goal and HInkey Haines led the club with six TDs overall. Ernie Nevers, showing an impressive durability, ranked second in the league with 8 rushing touchdowns and, adding in 11 extra points and four field goals, his 71 points. He was a consensus first-team All-NFL selection.